Here in western Washington, we have somehow managed to circumvent summer and head right into fall. The long hot days and balmy nights were not missed by many (in my circles anyway), and fishing seemed more “productive” because of it. From my point of view, it will only get better from here. With fall on the horizon, my mind is drooling over the thoughts of returning salmon and cooling temps for big hungry trout. Another vision fluttering through my mind is the October Caddis. This caddis, sometimes called the “Fall Caddis”, is one of the biggest caddis species that we have on the west coast. It emerges in the fall (hence the name) and can provide some great big dry fly fishing. You can find these critters on a few of our local waters as well as on the eastside of the cascades. While the adults provide some terrific dry fly opportunities, other stages in the October caddis lifecycle are productive as well. The October caddis is a case building caddis. They will sometimes become dislodged when moving about or when building another case and fall victim to the river currents hurling them into the path of a hungry trout. 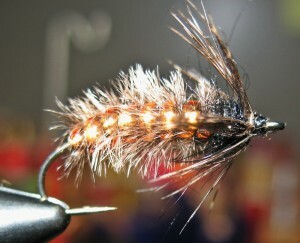 The See-Thru Pupa is my take on the October Caddis during its underwater phases. It utilizes the translucent qualities of V- rib, exaggerated by a layer of gold tinsel underneath. The v-rib alone provides no movement or life like qualities, so to make up for this I have added a wrap of Ostrich herl between each wrap of v-rib. The natural has a dark, almost black thorax region and dark legs, for this I use dubbed Angora goat and a dark Hungarian partridge feather. Since it is hard to add weight to this fly (without using a bead head, which you could certainly do), I usually fish this fly under a heavier pattern such as a cone head wooly bugger, or a large stonefly nymph. However, if swung near the surface before or during a caddis hatch, it can be very productive as well.